NO START solenoid clicks but no turnover. whats wrong? 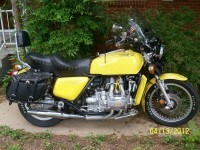 1975 GL 1000. Power is on, bike is in neutral, starter switch turned to run, gas is on, battery is fully charges. connections are tight, connectors cleaned with small brass wire brush, brand new starter. checked new starter with jumper cable before installation. all fuses checked and good. when i press my start button my solenoid clicks but no start. is my solenoid bad? Re: NO START solenoid clicks but no turnover. whats wrong? Take a voltage measurement at the starter post. If you have 12 or near that then starter is the problem. You can also short across the two large terminals of the solenoid to test. You say you have a new starter. There are a few starters on ebay that fail the first time a load is placed on them. The planetary gear inside breaks. I did a voltage meter to the posts while they were attached to the battery. it did read 12. so I thought my reading was wrong and I was doing this incorrectly. what does short across the 2 large terminals mean? sorry new to wiring. I tested my starter x 2 with jumper cables before installation. do you think it still could fail? The solenoid is a heavy duty switch to activate the start motor. If you can make the starter turn over by direct connection to a battery, you have eliminated it as the cause of the problem. Work back from there and ensure the connections to the solenoid are clean. The solenoid may be internally corroded. Sand paper fixes it. If you choose to take it apart desolder the fine wire before opening. I have neglected to do so and ripped the coil wire too short to salvage.